The only part of the park accessible by road is Exit Glacier. Here you can stroll the trails, walk very close to an active glacier, or take a ranger-led walk. Exit Glacier is a place where you can witness up close how glaciers re-shape a landscape and learn how plant life reclaims the barren rocky land exposed by a glacier’s retreat. When you get up to the blue ice face of Exit Glacier, you can hear it crackle and pop. Exit Glacier got its name from being the exit for the first recorded crossing of the Harding Icefield in 1968. Snowfall on the Harding Icefield that feeds the glacier can exceed 100 feet each year. After 4-10 years of compression snow turns into glacial ice. In the spring of 1968, the first documented mountaineering party succeeded in crossing the Harding Icefield. Ten people were involved in the crossing, which went from Chernof Glacier east to Resurrection Glacier (Later renamed Exit as the newspaper reported that the group would be descending the “Exit Glacier”). The expedition left Homer on April 17, bound for Chernof Glacier; eight days later, they descended Exit Glacier and arrived in Seward. Along the way, the party made a first-ever ascent of Truuli Peak, a 6,612-foot eminence that protrudes from the northwestern edge of the icefield near Truuli Glacier. Ranger-led walks to Exit Glacier are offered at 10am, 2pm and 4pm daily. These walks are approximately 1–2 hours in length. There are also Ranger Talks held in the Exit Glacier Pavilion at 12pm. These last approximately 20–30 minutes. Guided hikes on the Harding Icefield Trail are offered on Saturdays from July 5 through August 30. The hike departs from the Exit Glacier Nature Center at 9am. The Exit Glacier is especially notable for being a drive up glacier (similar to the Mendenhall Glacier of Juneau). To get there, turn onto the Herman Leirer/Exit Glacier Road at mile 3 of the Seward Highway. The 8.6 mile road to the Exit Glacier Area is paved, making it easily accessible to all types of vehicles. Taxi/shuttle service is available from Seward in the summer. In the winter, snowcoach service is available. Exit Glacier is open year-round. Upon the arrival of snow, usually in mid-November, the road is closed to cars but open to a wide-range of winter recreation – from snowmachines to dogsleds and cross-country skiers. The road often remains closed through early May so be sure to check current conditions if you are visiting during the shoulder seasons (spring or fall). From the Nature Center a network of short trails leads to different views of Exit Glacier. Start by turning left at the Nature Center and following the accessible trail through the cottonwood forest to Glacier View, a panoramic vista of Exit Glacier spilling down from the Harding Icefield. 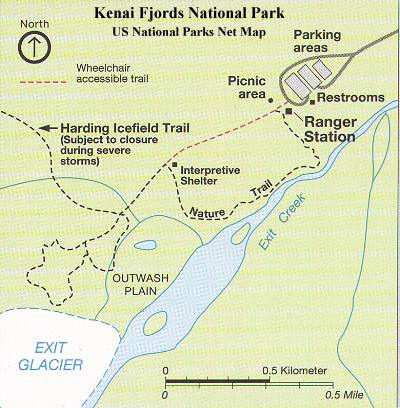 This one-mile accessible trail loops back to the parking area, but if you turn left at the trailside kiosk you can continue on toward the Toe of the Glacier and Edge of the Glacier. Getting to the Toe of the Glacier requires crossing the rocky outwash plain. This area may be not be accessible due to frequent floods and there is no set trail across the outwash plain. If water levels are low, you can make your way to Exit Glacier’s terminus, but don’t approach the glacier in places where the ice is over your head – huge, heavy chunks of ice fall off without warning. There is a well maintained trail to the Edge of the Glacier. This moderately strenuous trail brings you near a wall of blue ice providing the most dramatic close up view of Exit Glacier. If you are looking for a longer day hike, don’t miss the Harding Icefield Trail. A map of all the trails in the Exit Glacier area is posted near the Nature Center. The Exit Glacier Nature Center includes hands-on exhibits and an Alaska Geographic bookstore. Flush toilets, near the Nature Center, are operable from Memorial Day through Labor Day. The rest of the year pit toilets are available. Exit Glacier has a 12-site, walk-in campground. Click to see our Exit Glacier Trail Map page. Pink salmon — too much of a good thing? Where are the Yukon Chinook Salmon Headed?